The Ruapehu region fetaures the magnificent 800 square kilometre Tongariro National Park, home to three active volcanoes: Ruapehu, Ngauruhoe and Tongariro. Often referred to as an 'outdoor adventure playground', this central North Island region offers a wide variety of recreational activities to suit everyone. 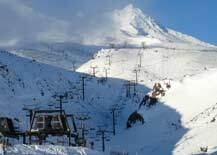 During the winter season people flock to the internationally recognised ski resorts of Turoa and Whakapapa, both situated on the slopes of Mt Ruapehu. After enjoying a fantastic day skiing or snowboarding, Turoa's base town, Ohakune, is an excellent choice for some apres-ski dining, entertainment and accomodation. Closer to Whakapapa ski field is National Park, where you'll find some great places to eat, drink and give your body a well earned rest! 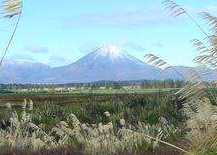 The summer season in Ruapehu offers many recreational activities for outdoor enthusiasts. Whether you choose hiking, abseiling and rock climbing in the stunning alpine, or canoeing, rafting and world class trout fishing in the sparkling rivers, you can be sure you'll have an adventure to remember! A popular hiking trail offered by the Department of Conservation, is the Tongariro Northern Circuit which winds its way over Mt Tongariro and around Mt Ngauruhoe. This walk passes through unique and stunning landforms which include colourful volcanic crater lakes, steam vents and glacial valleys. The scenery in this region is so other-worldly that it was used in Peter Jackson's film The Lord of the Rings. The Grand Chateau Tongariro offers high end accomodation at the base of Mt Ruapehu in Whakapapa Village. Constructed in 1929, this Category One Heritage Building is legendary for it's superior service and heavenly cuisine. In addition, the Chateau is also a popular venue for weddings and conferences. Whether it's the summer or winter season, the Ruapehu region has it all. The links below will help you guide your search through all the information on KiwiWise regarding this wonderfully diverse area of New Zealand.